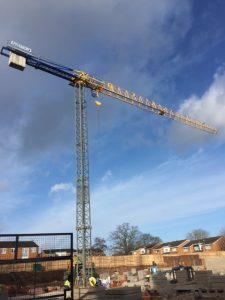 In 2017 we placed a Tower Crane on a Care Home Project in Studley. It is still in place on site, having been erected on November 17 for a crane hire period of at least 20 weeks. The Tower Crane has a 35m jib and can provide a Hook Height of 24m. The maximum load capacity is 6,000kg, with a load of 2,600kg possible at the end of the j ib. The project involved the demolition of the existing building and the construction of a new care home called the Four Acres Care home, designed to to make a positive contribution to vulnerable adults in the local community. Upon completion is is planned that skilled staff will be on hand for any complications, while residents will be able to enjoy a wide range of activities and comforts as they see fit. Are the Pedestrian Operated Cranes safe in high wind?